The lady contacted me several months ago and wanted to have this painting to give to her husband on his 50th birthday a few weeks ago, as he was one of the scientists and engineers at the Jet Propulsion Laboratory who worked on designing and building Curiosity and the Sky Crane. We decided on a good size, good price and that it would be an acrylic on stretched canvas painting rather than my traditional reverse glass painting (mostly given the short time constraint - glass paintings take a lot longer to dry between painting sessions). So I set out to do the research so that I could make both the Sky Crane craft and the Curiosity rover as close to accurate as I could, given that I wasn't able to take reference shots before they were launched. We had visited the MSL lab at JPL, where the sister rover is, some months earlier and did take some shots but this commission had yet to come along, so the angles didn't match what I wanted to paint. I found a number of reference photos and from there could piece together what the two craft would look like in the composition that I had. Then came the fun part of actually painting the piece! Since it was a large canvas, 36" x 22", I needed to have it set up on my easel rather than on my drafting board. And using an easel meant I could move it into the living room or out on the deck (for airbrushing) whenever I needed. Here you can see one of my kitties helping me apply the rock texture to the Martian landscape. Lots and lots of little rocks, and she was a big help! Working in so many different media, it is really nice to be able to switch the gears in my head and go from one to the other. It gives parts of my brain a chance to rest and renew while the other parts work. I haven't had the opportunity (see what I did there? LOL) to work on a canvas painting for quite a long time, so having this chance really buoyed my spirit (LOL). But seriously, it was a delight to be able to sit and physically move around the rich lustrous paints and feel the canvas giving way under my brush. I don't get to feel that very often as when I'm working on glass, the paints can't be thick and gooey, and of course there is no "give". When I'm working with blown glass or cast glass sculpture, I often can't physically touch the pieces at all since they're at such a high temperature. This felt almost like a vacation, as I could sit on the couch and have on a marathon of Doctor Who while I worked. And it showed me that I really need to do more painting. 36" x 22" acrylic on canvas painting of the Mars Science Laboratory, Curiosity, getting dropped off in Gale Crater on the Martian surface via the Sky Crane. It is a beautiful piece and I'm very happy with how it turned out. Yes, indeed, I will be doing more painting soon. Scientists selected the landing site, Gale crater, from a shortlist of 30 because they believe it has deposits left by water-carrying sediments, and also that a nearby mountain is rich in minerals which form in water. 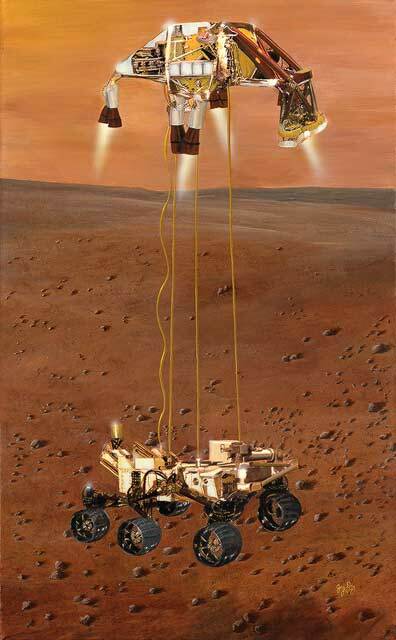 The rover will descend by parachute attached to a "sky crane" before being slowed by thrusters as it approaches the surface. It is then lowered from the crane in a harness: a novel landing method.